Amerejuve River Oaks will hold its grand opening, complete with special pricing and giveaways, on Dec. 5 at their location at 1934 W. Gray, Ste 201. Manager Alda Patino and nurse injector Amber Black and the entire staff are pleased to offer their care and experience to the River Oaks community, and additional information is available by calling (713) 960-6262. Amerejuve River Oaks is located at 1934 W. Gray Ste. 201, inside the Chase Bank building. Amerejuve's growth from one location three years ago to 10 locations now is amazing and speaks for the amazing team behind it. 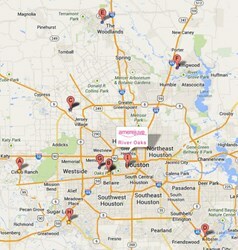 We are pleased to be the leading provider of medspas and esthetic care serving Houston. 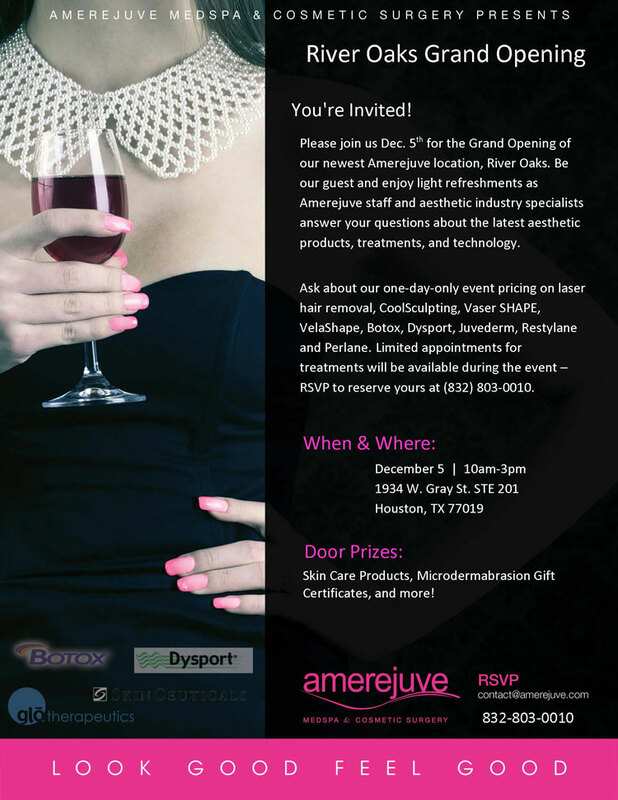 Amerejuve MedSpa and Cosmetic Surgery announces the Grand Opening of Amerejuve River Oaks will be Dec. 5th from 10 a.m. to 3 p.m. The Grand Opening will feature one-day-only event pricing on laser hair removal, CoolSculpting, Vaser SHAPE, VelaShape, Botox, Dysport, Juvederm, Restylane and Perlane, as well as light refreshments, and giveaways. Amerejuve River Oaks is located at 1934 W. Gray, Ste 201. Manager Alda Patino said she takes great pride in helping clients look good, feel good, and increase their confidence. Patino said Amerejuve services can have a huge change on a person’s appearance and outlook, whether they choose a simple microdermabrasion to brighten and refresh their skin to body contouring to noninvasively remove extra inches to the many other services available. “I love getting [medspa] services myself,” she said, noting she’s not only knowledgeable about Amerejuve services, but she can discuss many of them from personal experience. Patino is joined at the River Oaks location by Amber Black, a nurse injector who specializes in injectables such as Botox and Juvederm as well as other procedures. Black believes in treating the whole person, and says one of the most important parts of her job is listening to her patients. Black’s background also includes nutrition, fitness, surgical technology, and a number of aesthetic procedures. She’s also board certified with the AADP. Having gone through difficult medical situations in the past, she sees it as vital to educate and inform others about caring for themselves inside and out. Black said it’s key to learn each person’s specific needs and goals to determine the best way to achieve them, whether through a single procedure or a system of treatment. Black is also active in autism awareness and is an award winning competitor in figure competitions, a type of body building competition. She strives to use these activities as platforms to build the wellness and confidence of others. Amerejuve River Oaks is open Monday through Saturday and offers free consultations on their wide array of aesthetic services. Patino, Black, and the entire Amerejuve River Oaks staff look forward to serving the community.